If you wish to invest your savings or make a larger capital investment, you face a dilemma: Treasury bonds no longer generate a return, or are risky; gold and equities are currestly too expensive. Real estate values in the west German cities, especially Hamburg, the Cologne-Bonn metropolitan area, Frankfurt, Stuttgart or Munich have also steadily increased. By now, investors must often accept initial yields of no higher than 3 per cent. However, there is a safe alternative: Robust centres for real estate investment are by now also evolving in eastern Germany. The metropolitan area Halle/Leipzig is one of these centres, alongside Berlin, Dresden, Jena and Erfurt. 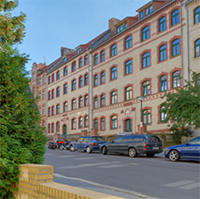 But because investors often follow the crowd and tend to invest in cities in western Germany, much higher yields may still be achieved in Halle and Leipzig – despite the fact that rents still tend to be lower. These places therefore offer favourable buy-in opportunities – and an investment, provided it involves a good location and active management, offers good prospects for value growth. Leased out condominiums, blocks of flats, equity capital or other real estate investments: There are a number of options. But: A capital investment should not be arranged on the Internet. If you are interested in investment opportunities, simply fill in the contact form and let us know how you may be reached by phone. We will give you a call.